We specialize in quick turnaround on a variety of popular print materials, commonly within 1-2 days. Even thought it’s fast, you don’t need to compromise on quality. 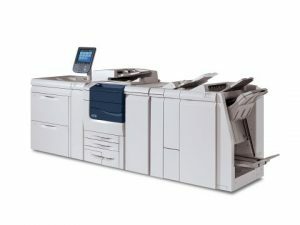 Our press-quality digital printers provide beautiful colour and grayscale output on a variety of paper types and colours. Why print thousands when hundreds will do? Print what you need when you need it. Smaller quantities reduce waste and save money. Why keep throwing out-of-date print materials in the trash bin? We make it easy for you to submit your print job and get it back quickly. Files can be submitted and proofed on-line so there is no need to leave your office. Our in-house design service can quickly fix printing problems or give a new look to your business. We offer next-day delivery service throughout the Grey-Bruce region and 2-3 days in other parts of southern Ontario. Got a Little More Time? Our standard print delivery time 5-7 business days and applies to large quantities, specialty work or jobs that must be run on a standard printing press. We offer significant price savings on large volume jobs that can make the wait worthwhile.